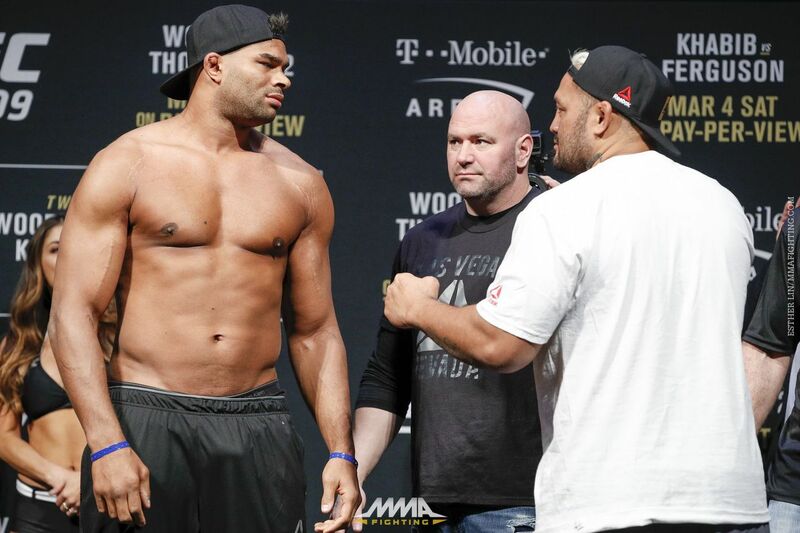 This is the UFC 209 live blog for Alistair Overeem vs. Mark Hunt, a heavyweight bout at Saturday night’s UFC event at the T-Mobile Arena in Las Vegas. Overeem, who has won four of his past five fights, will face Hunt, who is 2-2 with 1 no-contest over his past five fights, on the main card. Check out the UFC 209 live blog below. Round 1: Kicking off the main card, a heavyweight rematch from 2008. Referee is Marc Goodard. They touch gloves. Leg kick right off the bat from Hunt, loud. And another. He comes in again, and Overeem comes over tip with right hand. There’s a big cut on Hunt’s leg pouring blood, from a checked kick. Wow. Right hand from Overeem, and that glances Hunt. Oblique kick from Overeem, an Albuquerque specialty. Hunt comes in to throw, loses momentum and bulls into Overeem. Weird sequence. Big body kick from Hunt, and that hurt. They clinch, and they Hunt shoves Overeem off. Short right counter from Overeem was a stinger, lands nice. Hunt unfazed. Nice right counter from Hunt knocks Overeem off balance, and he reels back on his heels. Very deliverate stuff from both guys, and so far Hunt landing better/heavier. Overeem with a kick to the body, and then a feint of the same. Another big body kick from Hunt, and the crowd loves that. Combo from Overeem and he is attacking the lead leg of Hunt. Reem switching stances a lot here, giving Hunt plenty to think about. Hunt trying to keep Hunt close, and now at the end of the round Hunt blasts away at Overeem’s body as Overeem covers up. MMA Fighting scores R1 for Hunt, 10-9.